This entry was posted in ~ Moonshine! ~, ~ Travel ~, ~ Wine, tuak & champy ~ and tagged Borneo, Kuching, laksa, rice wine, Sarawak, Tuak by Deep. Bookmark the permalink. would like to know if Mary Jane is selling her home made tuak??? thinking of getting some from her… would appreciate if u can reply me. hahah Trading for commercial purposes are illegal 🙂 How did you find this site? You a friend of Deep? Sounds great, but bit sloth to work that whole process out and wait for months..Mary J, any chance I get a sampling? cheers! hah..Mary J, u meant leave it to fate ? that would highly unlikely i would cross your path! LOL! anyways, do drop me a mail if you’re happy to share your special tuak. cheers! hie! how much of water to be added to the sugar? i believe that would determine how thick or light the tuak will turn out right? any suggestion on the water measurement? My name is Philip. I’m a chef in Melbourne, Australia and I have recently entered a competition and I plan to cook Kacang Mah which is a very known hakka dish back home in Sabah. 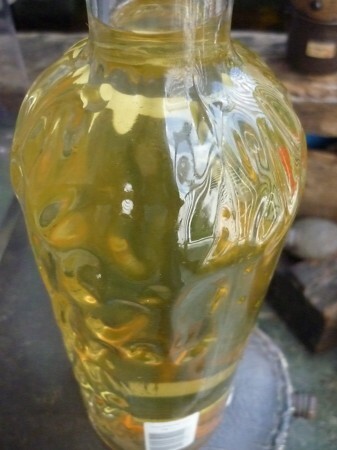 But I really need to learn how to make Tuak for it is the main base that gives its flavour. I really hope you can help me out as I’ve searched high and low for recipes and yours is the best. I’ll forever grateful to you. Cheers! This is so cool. How do you bottle it tho? Mineral water bottles? I’m planning to make a batch, and do a naked dance around it just to be sure. Hi MJ, was just wondering abt the amount of yeast… i got a similar recipe from my aunt in sarawak, but the amount of yeast is way more than what u indicated. She uses 10 pieces of yeast for 1 kg pulut. But the yeast she told me to buy was from an indian kedai runcit… (cost only abt 60sen) per piece. Just wanted to know if the yeast u used from the chinese med shop comes in bigger size (and maybe that’s why u only use 1.5 pieces ?). 10 pieces is a lot of yeast! dunno, never tried so many before. Try it & let me know. Maybe it’ll taste nicer? Yes, it’s a bout 50cents from the chinese shop and it’s about 1 1/2 inch in diameter. 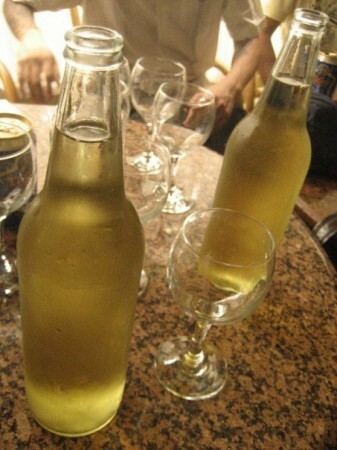 hey…me and my buddies kinda completed our tuak project. 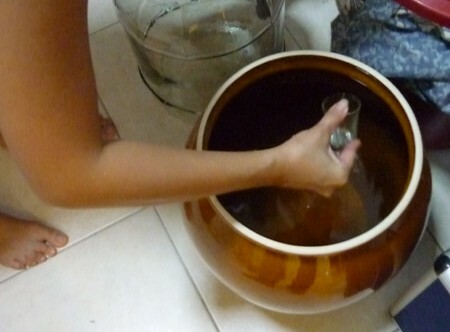 But instead of 1kg, we went on to make tuak with 3kg rice and hence with 3kg sugar, so you can just imagine how bloody sweet it’ll taste.Anyway, the due date was on the 17th of december last year,but it was so sweet,we taught of keeping it for another month.Do you think the longer we keep it, the better it’ll taste? This is what Mary Jane my tuak consultant says- “No guarantee that it will taste better coz the yeast might make it more sour. Adding water is the best option. You can also add peach vodka for flavour & a stonger kick. Thank you! Pleeeeeeeeze tell me what this hotel is in Kuching–we are going there for the first time this year for the Rainforest Music Fest and want some of that laksa!! Hotel’s called Telang Usan. Off Ban Hock Rd, downtown. Tel: (082) 415-588. Might see u there dis year. Enjoy! I’m also a fellow brewer and but new to KL. i was wondering if you could tell me where to get the clay pots and glass containers i see in the photos. In case you are interested to try, i have experimented with raisins, honey, various types of sugar (gula melaka, Sugarcane, etc), mineral water and/or a combination of the above. Adding ginger will also give you a nice zing in the drink. I can be reached at gabriel_ong@yahoo.com or just post the comments here. Will get u two in touch. Well, I’ve started. Many thanks to Deep and Mary J. Will update you guys in a month on the success or failure. i tasted it at my longhouse! around 12-15yrs. that’s true vintage, guys..
Thirsty Brother….I linked to your posting! n 2day ‘s my 62nd birthday…. Will love to have some of your home made tuak.. Long way from home(sabah) to have some..
jsut wondering if you happen to know anything about tuak storing like how long it can be store. Hi. 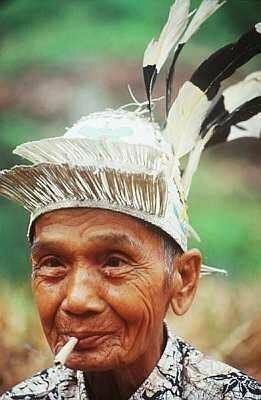 I’ve drank tuak aged 15 years. Generally, the older, the nicer it tastes. U shd be able to tell by the looks whether it’s still good. bro, mind asking Jane where she got her pot? ok i finally strained the brew on Christmas, left it an extra day for it to chill and drank some yesterday, it’s sweet and smooth, stronger than beer, i would put it somewhere in the 10-15% alcohol content (rough estimate). my brew however isn’t as clear as the ones in the picture, but heck it tastes so good! my dad who drinks rice wine loves it! 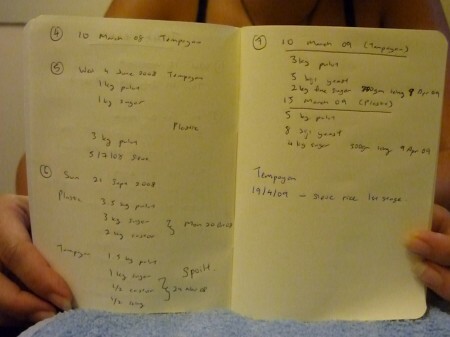 I am tweaking the recipe to understand brewing more and i will share my findings here. P.s. I use 2 chao peng and 2 liters of water to 1kg of sugar. it comes out as sweet as coca cola so adjust accordingly. 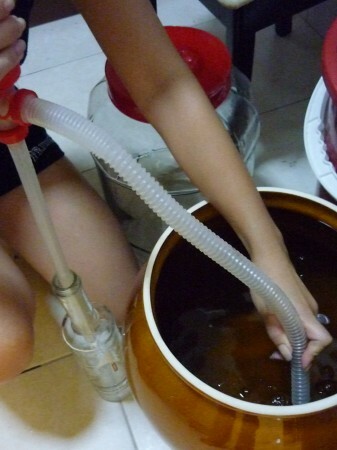 hi, i’m making my 2nd batch of sugarcane tuak, however larger quantity, about 4litres, in the jar, there is this one white layer or coating that surfaced after 2 days of fermentation. just checking if any of you guys know what is it. 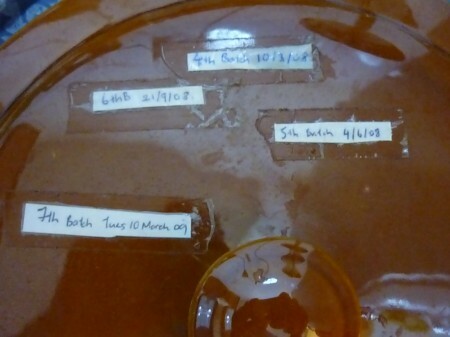 result of the yeast? or its mold? Hi Alvin. That’s just the yeast working. Is your container air-tight? yes it is. i’m using glass jars that is used to make red rice wine. awesomee! i would like to know if the proportion is 1 kg rice and 1 kg sugar , how much water should be used to make the syrup? i am afraid my tuak might end up too watery or thick if i guess. Also your recipe only adds up to 2 months and 1 week but you mention it takes 3 months to prepare. so what happened to the left over 3 weeks? From MJ: Hi Ashrel, I haven’t made tuak in ages as I moved out of the country (glutinous rice is hard to find here) so memory might be a little rusty. You might not get the mix right the first time as being living breathing organism, the batch is always different each time. You’ve just got to experiment and try again. Temperature and the container it brews in will effect it too. I’m not too sure about how much water to put in but the sugar water shouldn’t be too thick. The yeast will eat the excess stuff anyway. You can stretch the waiting time from 6 to 8 weeks. Stretch the waiting time to 2 – 3 weeks after you’ve strained it too. Just have a play and try again if your batch doesn’t work! Does the container have to be air tight or just enough to make sure insects and dust dont get in, that is allowing a low level of oxygen but still allowing for fermentation? No, it doesn’t and shouldn’t be air tight. Glutinous rice is actually starch/sugar. The fermentation process will separate the sugar (glucose) into 2 different compound – ethanol and CO2. If the container is airtight, CO2 will be trapped and caused pressure buildup. In high pressure environment, the yeast will tend to “hibernate”. Hence stopping the entire fermentation process. I reckon using a cloth to seal the opening of the container to allow airflow while prohibiting insects from getting in.